TV show dates: October 3, 2017 — December 12, 2017. Performers include: Brandon Micheal Hall, Lea Michele, Bernard David Jones, Marcel Spears, Yvette Nicole Brown, and David Spade. From creator Jeremy Bronson, The Mayor TV show centers on struggling hip-hot artist, Courtney Rose (Hall). After years of drudgery in the closet of his small apartment, he decides he needs a publicity stunt to create some buzz around his fledgling music career. Courtney decides to run for mayor of this hometown, Fort Grey, California. The plan is brilliant, until the voters, who are drawn to his natural charm and candor, actually elect him. Despite being a neophyte, Courtney has a certain knack for politics. While his intelligence and creativity lend themselves well to his new position, this is his first full-time occupation, so he needs a little help growing into the role. Luckily, his mother, Dina Rose (Brown), is at the ready to watch over Courtney and his new administration. While she’s crazy about her son and believes in him, she does not hesitate to tell it like it is. Dina also serves as a mother of sorts to T.K. Clifton (Spears) and Jermaine Leforge (Jones). Although they’re great friends to Courtney, they do not appear particularly suited to serving in his administration. Finally, there is Valentina Barella (Michele). Valentina originally managed the campaign of losing candidate, Ed Gunt (David Spade). Upon realizing though, that Courtney sincerely wants to make a difference in Fort Grey, she signs on as his Chief of Staff. Valentina plays things by the book and expects no less than perfection. Motley though it may be, Courtney has surrounded himself with a crew that truly wants him to succeed. Now it is up to him to accept the responsibilities of his office and faithfully execute them. First aired: January 25, 2018 (released on Hulu). What do you think? Do you like the The Mayor TV series? Should this TV show have been cancelled or renewed for a second season on ABC? 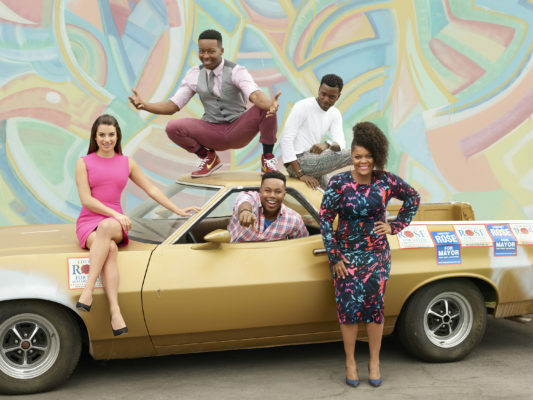 The Mayor on ABC: Cancelled or Renewed for Season Two? The Mayor: Why Didn’t the Cancelled ABC Sitcom Work? **shrugs** great….I was beginning to like this show. Could’ve given it one more season….worse shows have gone way longer. The Mayor hit on a new concept that hasn’t been rehashed and rebooted like so many other shows because no one is willing to step out on a limb. I vote to give it another chance. Let the writers focus more on current happenings in like cities, but keep some humor. Let’s face it, we at least need the funny as a society. This is/was one of the best shows I’ve watched in a long time. I’m so distraught that it was canceled:( Is there anything we can do??? Show that addresses social injustices that still exist today in a humorous and down to earth way is worth a watch. Must we always appeal to the lower common denominator of viewers that think Reality TV is legit? I agree. Finally, a show that I can watch WITH my kids. It’s the best show I’ve seen on television since the Cosby Show. Horrible show. A real yawner. Cancel immediately! Cute show give it a chance in a better time slot. Garbage Show. Please cancel ASAP. Glad this show was cancelled, stupid show, stupid idea.